At Helston in 1888, Miss L.J.Trevenen , representing the Trevenen family, laid a foundation stone of a `Memorial and Mission Church`. 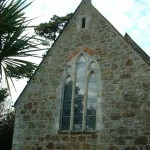 This pleasing little `chapel-of-ease` was erected through the generosity of the surviving members of the Trevenen family in memory of their parents. 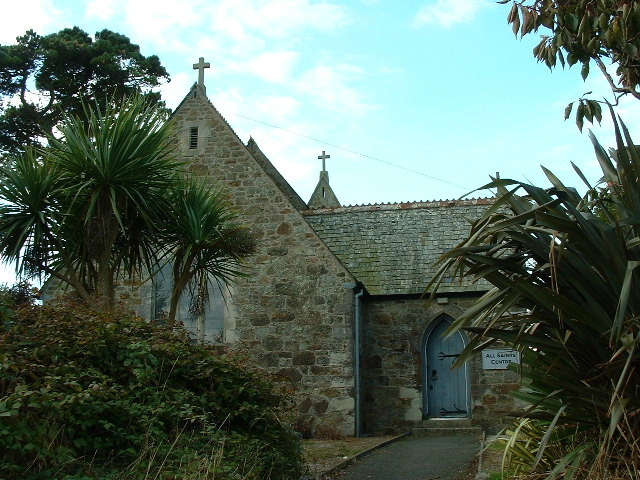 The chapel is very nicely situated at the top of the street, the road to The Lizard from Helston., and being Gothic in style it presents a beautiful appearance. The plans were originally prepared by Mr.W.J.Winn but subsequently they were amended in a few particulars by the Rev F.C.Jackson of Ruan Minor, who also practically superintended the carrying out of the work. All the dressing with the exception on the inside of the windows are of Forest Gate stone, which closely resembles the Bath free stone. Over the entrance to the church is a very neat rose window designed by Mr. Jackson, in which there are no less than twenty-eight pieces of this stone. The aisle and chancel are paved with tiles and the roof and seats are of pitch pine varnished. 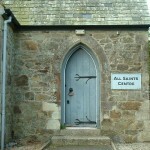 The building, which was intended to seat about 120 persons, and which cost about £600 or £700, was to be be a `chapel-of-ease` to the present parish church of Helston, and was to be known by the name of All Saints. The contractors were Messers J.C.Eva and J.M.Richards, and the work was carried out in a manner which reflect the highest credit on all concerned. Mrs. Jackson gave the Sedilia and a Credence Table with serpentine pillars and the Trevenen family contributed a beautiful lectern of burnished brass. The alter-table, most beautifully designed by the Rev. F.C.Jackson was the gift of Mr.M.Richards and his wife and is Mr.Richards’ own workmanship. The central panel van designed specially by Mr.A.E.Browne, Architect, London, and was carved in the metropolis. The font, also designed by Mr.Jackson, a most handsome one, was the gift of Mr. Rogers, of Penrose, and was carved out of one block of granite by Mr.C.Eva, and the alter plate was the gift of Miss Charlotte Roberts, Helston, the alter linen of Mrs. Mann, St.Issey Vicarage. The lectern was given by kiss Harriet Roberts, and the communion-plate by Miss Roberts. The bible and Prayer-book were the gift of Mrs. Hodge, The alms bags were the gift of Mrs. J. Sidney Tyacke. The Misses Trevenen of Batheaster, presented the alter cloth, coronea and standards. “To the Glory of God. In memory of James Trevenen, and Frances Jane,his wife, this church is erected by his surviving children. The opening ceremony in October 1888 was an important event in the history of Helston. It was dedicated by the Bishop of Truro who preached a sermon from the text taken from Hebrews XII v.22 & 23. The service was described as long and impressive. A private luncheon was afterwards held at the residence of Mr. W.Trevenen where the mobility, clergy,their wives and friends were entertained and in the evening, after devine worship had been held in the newly consecrated edifice, the workmen and others engaged on the works were through the kind hospitality of the Trevenen family, entertained to a sumptuous spread at the Globe Hotel. Many were the toasts and many tributes expressed to the workmen and others involved in the work which included the proposal of the health of Mr. Eva`s foreman, Mr. T. Eva, but although loud and long were the calls for the response, none came, except that he would rather do an extra day’s work than make a speech. Who would have given thought that 100 years from the laying of the foundation stone, pressure would be exerted to transform this sacred building into an edifice far removed from religeous worship.